at the St.Petersburg House of composers. 1990.
after the concert at the Bloshoy Hall of Leningrad philharmonic. 1982. S.M.Slonimsky after the concert at Samara Pedagogical University. May 1998. “Sergey Mikhailovich Slonimsky is a resonant name in our musical world. A composer of prominent calibre, brilliantly expressing himself in different genres and styles. A musicologist with particular composer's horizon and peculiar integrated feeling of music. A broad pedagogue a successor, preceptor и guide of traditions of the Petersburg school. An untiring musical public figure, rushing headily into process of Peterburg musical life. What a startling capacity for work and efficiency! And the single person contains all of that, and his name is Sergey Mikhailovich Slonimsky”. “Every time as musical voice of Sergey Slonimsky reaches my ears I feel almost as a child: all's well for the present, we haven't yet went astray”. Sergey Slonimsky is the Leningrad, Petersburg composer not to an official geographical attribute. His human and musician's inner life has generated under direct influence of this city. The Petersburg architecture, people, slow and regular current of dark Neva waters — all is a source of inspiration of the composer. He is a successor of the Petersburgian spirituality which was inherent to Igor Stravinsky, Nikolay Myaskovsky, Sergey Prokofiev, Dmitry Shostakovich, many other grown in this city artists and intellectuals with patrimonial background in here. S. Slonimsky's great-grandfather was a scientist, a contriver of a computing apparatus, and Academy of Sciences of Saint-Petersburg petitioned for awarding the Demidov Prize to him in 1845. He also worked on improvement of a telegraph apparatus. The grandfather was a Petersburg journalist, a regular contributor to “Herald of Europe” magazine. The cultural life of our county was a live substance but not only subject of history for him. The father of the composer, Mikhail Leonidovich Slonimsky (1897—1979), was a famous Russian writer, the one of founders of Petersburg literary association “Serapion Brothers” along with Mikhail Zoshchenko, Vsevolod Ivanov, Konstantin Fedin, Veniamin Kaverin, Lev Lunts, Nikolay Tikhonov and others. He took an active part in cultural becoming of new society, collaborated with “World Literature”, “Priboy” publishing houses, was the one of founders of “Leningrad Writers' Publishing House”. 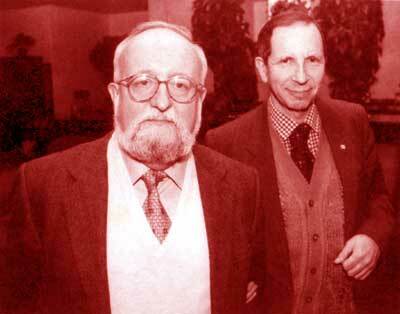 He was of many years a member of “Zvezda” magazine editorial board. He was a secretary to M. Gorky. From 1959 to 1963 he led the association of young prose writers attached to Leningrad branch of “Soviet Writer” publishing house. There were V. Lyalenkov, A. Bitov, S. Tkhorzhevsky, V. Konetsky, G. Goryshin among his charges. This creative climate influenced young Sergey Slonimsky deeply. He was aware of creative works by Evgeny Schwarz, Mikhail Zoshchenko, Konstantin Fedin at first hand, so to speak. There was a musical circle too: I. A. Vengerova, the aunt of Slonimsky, was a pianist, and his oncle was Nicolas Slonimsky, a notable American musicologist, composer, conductor. Sergey Slonimsky is related to Ossip Mandelstamm by Vengerova. S. Slonimsky was born on August 12, 1932. 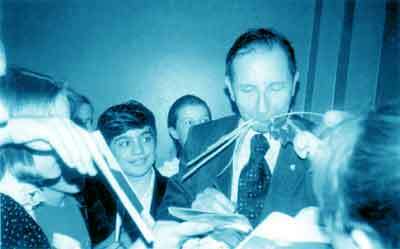 Since 1940 he began to study at Petrogradsky district musical school under A. Artobolevskaya (piano) and at Special Secondary Musical school attached to the Leningrad Conservatory named by N. A. Rimsky-Korsakov under S. Wolfenson (musical composition). 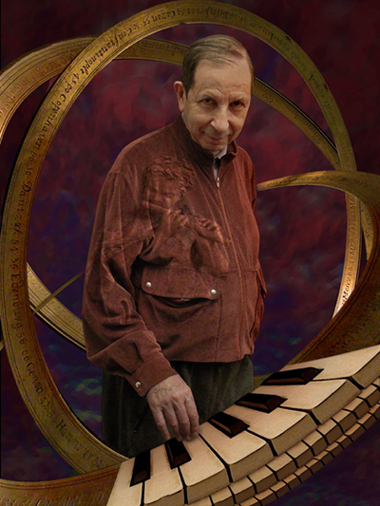 One of the first his compositions were songs for children on verses by Evgeny Schwarz. When the war began, the family has left for Perm. 1943—1945. These years he studied at Central musical school in Moscow. Implementing a recommendation by D. D. Shostakovich he dtgan to study musical composition under V. Ya. Shebalin. At the same years he practised in piano classes of S. Savshinsky. At 1950—1955 Slonimsky studied at Leningrad Conservatory. 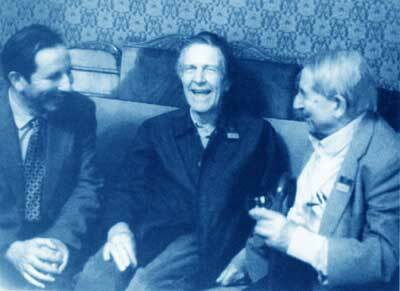 He attendtd lectures by F. Rubtsov (folklore), C. Kushnariov (tonal systems), N. Uspensky (counterpoint). The composer has his lot with the City. His musical style seems to be prolonged from Petersburg architecture, Petersburg landscapes, to be charmed with murky course of dark Neva waters. There is an all-embracing junction of noble styles. There is a being in strata of Petersburg intelligentsia. There is a longstanding professorate at the Conservatory. There are dozens of pupils. There are both domestically and foreign government awards. There are honorary titles. There are innumerable author's concerts. There are festivals of music by Slonimsky. And at the same time the composer constantly appeals to youth both in his creative works and in his broadcastings, he incessantly cares for education of little musicians, for introduction of whole generation of Peterburgians to top works of contemporary musical art.